When all UOSes enter low power state, VM management will notify the SOS lifecycle service and trigger the SOS to enter a low-power state. SOS follows its own standard low-power state entry process and writes the ACPI control register to put SOS into low-power state. Hypervisor traps the ACPI control register writing and emulates SOS low-power state entry. Once system resumes from low-power mode, the hypervisor handles its own resume and emulates SOS resume too. It is assumed that SOS does not trigger any power state transition until the VM manager of ACRN notifies it that all UOSes are inactive and SOS offlines all its virtual APs. Save the context of console, ioapic of SOS, I/O MMU, lapic of SOS, virtual BSP. Save the context of physical BSP. 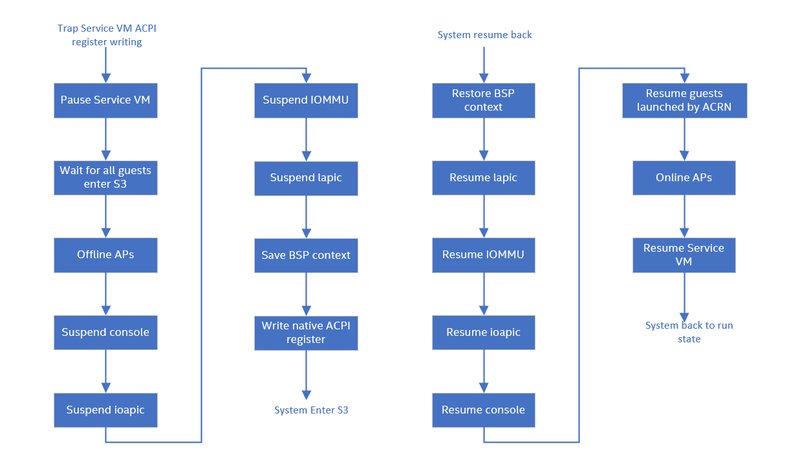 When exiting from low-power mode, the hypervisor does similar steps in reverse order to restore contexts, start APs and resume SOS. SOS is responsible for starting its own virtual APs as well as UOSes.